Aquarius Sun tend to be friendly, original, intuitive, broadminded, nonconforming, different, independent, freedom-loving, scientific, unusual, and helpful. They can also be impersonal, unpredictable, tactless, rebellious, unconventional, stubborn, rigid, radical, bohemian and eccentric. Aquarius natives like any work which calls for inventiveness and the detached application of special rules or formulae. Aquarius natives seek to share knowledge with others in order to bring about a better life for all. Group activity is their customary mode of operation. Helping others so they can help themselves appeals to an Aquarian. Aquarius natives are friendly, yet detached, they have warmth, yet they seem distant. Although appearing cold or aloof, they are not really indifferent to others. It’s just that they are much more concerned with humanity as a whole rather than any one particular individual. Since Aquarius natives generally do not have large, pompous or stuffy egos, they rarely bother to exert themselves to win approval or compliments. Aquarius natives get excited about bringing new ideas and methods into old, traditional environments. They are philosophical, visionary and idealistic. Feelings of friendship drive them to try to improve the lot of everyone they can. Sometimes the people they want to help don’t understand these new ways and react negatively toward them. Sometimes Aquarius natives are simply ahead of their time, although sometimes they are just cranks. 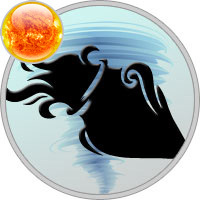 Aquarius natives have the determination and persistence to get ahead, but sometimes their energy level is relatively low, which causes them to drop projects before they are completed. Their minds are analytical and scientific and they have the ability to think things through to an accurate conclusion. Although they generally have good powers of concentration and are able to assimilate a lot of information, there are times when they are just plain absentminded. Aquarius natives usually get along well with others. They are generally not gossips, nor are they petty. They do not like arguments, unless they feel there is a need to defend a person, an ideal or a principle. Since Aquarius natives are so willing to listen to the new and different, they have little patience with those who refuse to hear new concepts. Sometimes Aquarius natives rebel just for the pleasure of it. They have been known to deliberately do things in an attempt to shock people. Most Aquarius natives prefer not to be bound by schedules and regulations, but can easily adapt to them if they must. But don’t expect them to always be on time for things. Aquarius natives dislike people who are possessive of them, since they are generally not possessive of people or things themselves. They give others a lot of personal freedom and they expect the same in return. Since they are not particularly concerned as to what other people think of them, they often do not bother forming opinions about other people’s behavior. In love, Aquarius natives want an intellectual companion with whom they can communicate. They can be hesitant about making a total commitment such as marriage, or any other form of partnership, because of their desire for independence. However, when an Aquarian marries, the marriage is usually stable. They are loyal and faithful to their marriage partner, but are not prone to excessive displays of affection, especially in public. Aquarius is fixed Air, and its keyword is "I know". The last of the serpent or power signs, Aquarius the Water Bearer is actually pouring the waters of universal consciousness into the mind of individual man. The universal thinker, your detachment and impersonality can be maddening to your intimates, who often want you to show more personal bias. You’re open-minded, democratic, progressive and enthusiastic, and have a definite sense of mission. A rebel and an individualist who shuns restraint, your strong will and reluctance to compromise can make marriage or unions difficult. You do well in organizations, business and groups, and often get more emotionally involved with work than with others. Aquarians are mental trailblazers and forward thinkers, helping others out of their mental ruts. You may need to learn responsibility, restraint and respect for limitations in the way things are, however. You’re right at home with different cultures, peoples, and lands. Aquarius rules the ankles and the circulation, so too much self-will can impede the flow of energy in your body.